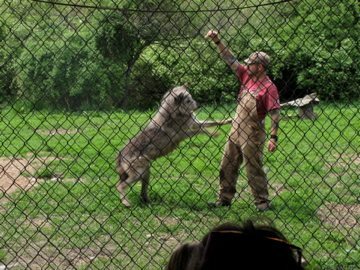 Wolf Hollow is a small wolf sanctuary, but popular, now having two presentations a day on Saturdays and Sundays, year ’round. When you arrive you’ll find their new gift shop, which sells replica wolf teeth, wolf t-shirts, water bottles, baseball caps, photo frames, stuffed toy wolves, and more. 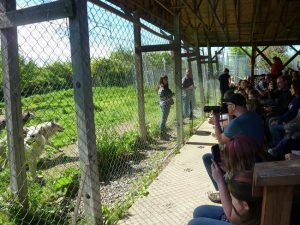 Then you walk back and sit outdoors, in a covered shelter with bleachers, to hear a presenter, who speaks for an hour while staff play with and show off the wolves. 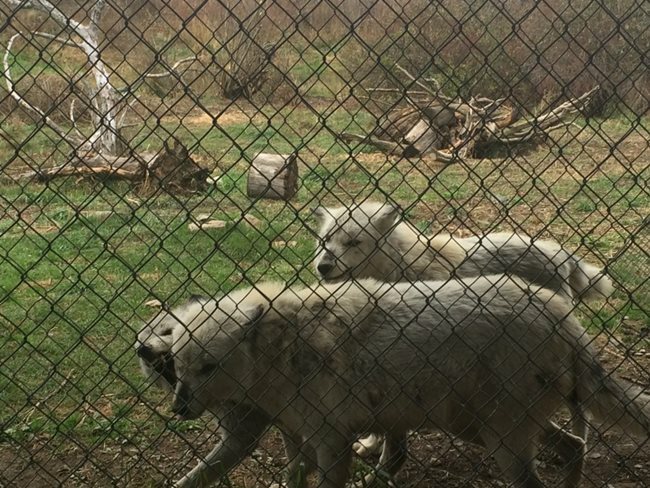 The 5 grey wolves are kept behind two layers of chain link fencing, so you don’t get the best views, but they are interesting, licking and hugging the staff, pacing, playing, and doing their business during the lecture. Wolf Hollow doesn’t glamorize them as pets and doesn’t teach them tricks. Instead the wolves are left as natural as they can be. They don’t discipline them with “I’m the boss” punishments like dogs but instead change their behavior with distractions. It’s a remarkably intelligent and science-based show. It’s accessible for a general audience and kids, but not dumbed down, with little time spent on cute stories. Mostly, you learn interesting facts about wolves and their habits! For example, we learned that the term “alpha dog” is misleading, something that I’ve read elsewhere. There are no wolves in the wild in New England, and, elsewhere in North America, wolves have only attacked humans twice in 20 years. We learned about their sophisticated pack hunting strategies, and how after a kill the wolves will first eat their prey’s organs, which are rich in iron. 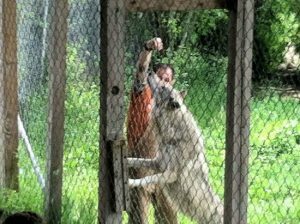 They give the wolves “enrichment”, a zoo term meaning they give the captive animals something to do so that they don’t have to just lie idle and brainless all day. We learned perhaps too much about how we can help stop wolves from being shot in the wild. Understandably, there was a bit at the end about how to stop wolves from being killed by hunters, and I was impressed how the show didn’t take a holier-than-thou attitude towards hunters and ranchers, whom they didn’t want to alienate. Best of all, at the end of the show, you get to howl, which causes to the wolves to start howling. I’ve never had an animal encounter quite like that. Our presenter, Zee, was high energy and fun. He interacted with the crowd, including taking questions, and used humor throughout the show. Unfortunately, having to shout without a microphone meant that his tone of voice was too monotone, and he has a verbal tic of using the word “again” too frequently. These things undercut the rich quality of the education, leaving us feeling that the one-hour lecture was too long. Also, the benches are solid rather than hollow, so you can’t put your feet under the bleacher row in front of you. For someone tall, this is uncomfortable. With excellent education on science and nature, plus getting to howl, but with only seeing the wolves behind a fence, and with the lecture given in a grating monotone shout, it’s hard to give a rating. I’ll say that with the addition of a microphone, and a modified enclosure with better views of the wolves, it would be a 5-star encounter. For now, 4 stars for Wolf Hollow.